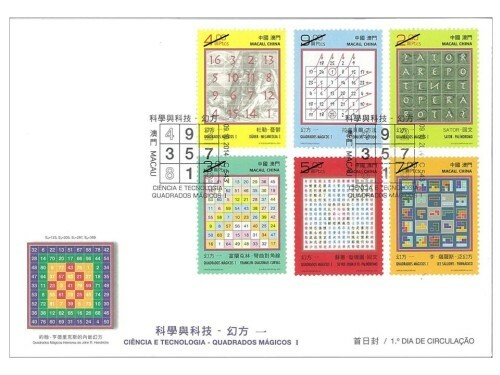 Macao Post issued the stamp themes “Composition and Construction of DNA”, “Standard Model of Particle Physics”, “Cosmology XXI”, “Chaos and Fractals” and “The Golden Ratio” under the stamp series “Science and Technology” between 2001 and 2007. 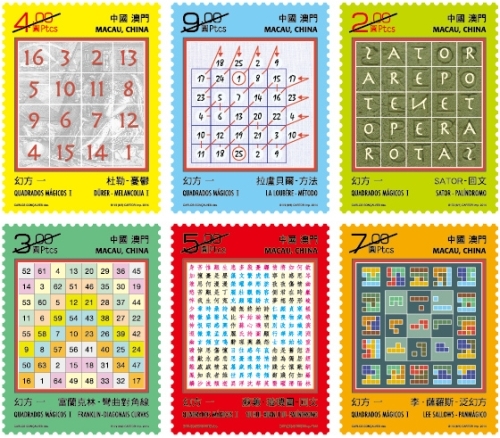 The sixth series with the stamp theme “Science and Technology – Magic Squares I” will be issued on 9th October, 2014. 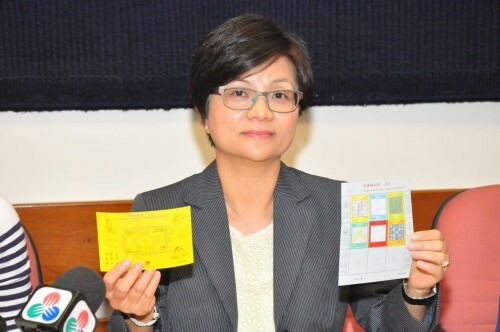 Through this theme, aiming not only to promote its scientific and cultural aspects, but to create also a unique product in the history of Philately. 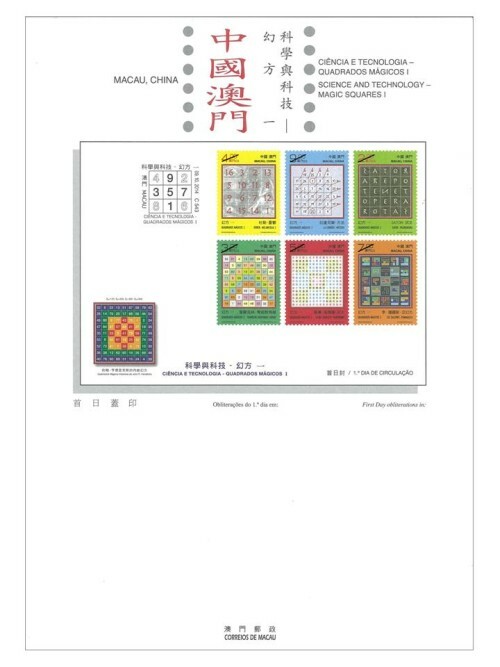 This issue includes a set of six stamps with the themes of “Dürer – Melencolia I”, “La Loubère or Siamese Construction Method”, “Sator – Palindrome”, “Franklin – Bent Diagonals”, “Su Hui – Xuan Ji Tu – Palindrome” and “Lee Sallows – Panmagic 3x3”, and the theme of souvenir sheet is “Luo Shu Magic Square”. 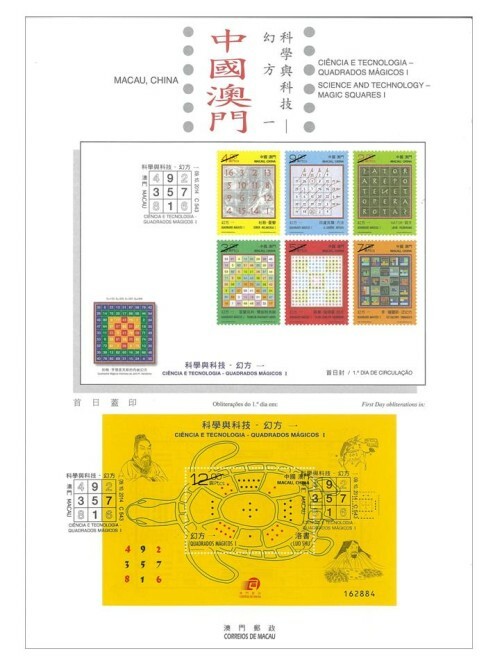 The interest in Magic Square is transversal in Chinese and Western culture. The importance of this theme in Chinese culture can be traced back to ancient times of its history which is shown by the myths illustrated in the Souvenir Sheet of this issue. 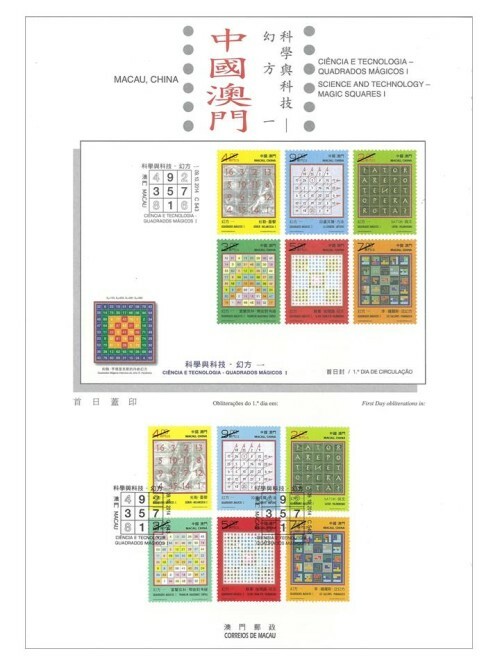 The Sheetlet presents a disposition for the facial values (1 to 9 “patacas”) equal to the disposition that the numbers 1 to 9 occupy in the souvenir sheet “Luo Shu Magic Square”. 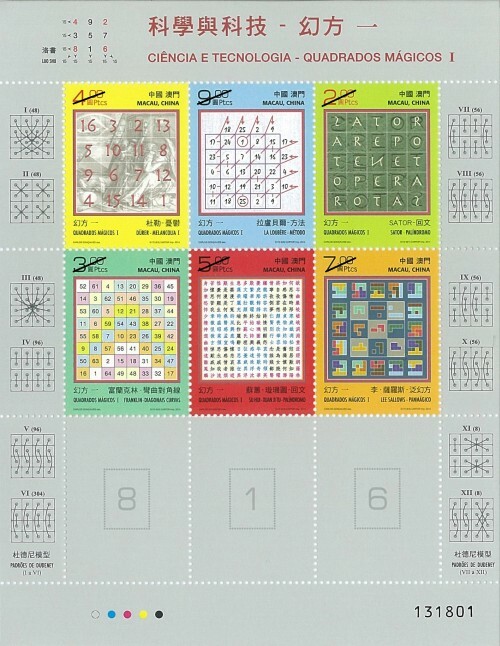 In this issue only 6 stamps are issued, corresponding to the first two Rows, with the third Row (presently without the corresponding 3 stamps) to be issued next year. This is the eighth issue in 2014. 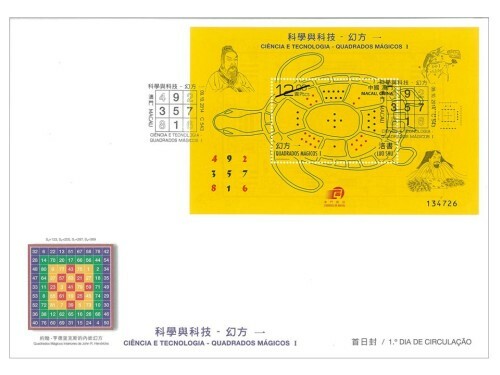 The previous issued stamps are “Lunar Year of the Horse” on 03/01/2014, “140th Anniversary of Conde de São Januário General Hospital” on 06/01/2014, the label stamp “Lunar Year of the Horse” on 14/02/2014, “130th Anniversary of Macao Post” on 01/03/2014, “Animal Protection” on 28/04/2014, “Literature and its Characters – The Outlaws of the Marsh II” on 26/06/2014 and “The New Campus of the University of Macau” on 05/09/2014. 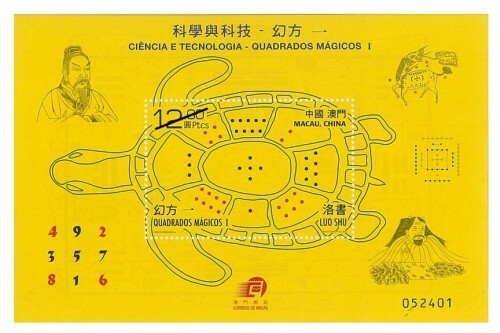 Technical Data of Stamp "SCIENCE AND TECHNOLOGY – MAGIC SQUARES I"